Microsoft skills are best learned hands-on. That’s why CBT Nuggets offers virtual labs with every Microsoft course — from MTA to MSCE. Learn more about CBT Nuggets Business Solutions. With the launch of Windows 10, workplaces are in need of IT professionals who can work effectively and efficiently with Microsoft’s latest operating system. Developing expertise using and administering Windows 10 can create professional opportunities to take your career to the next level. Generally, Windows 10 certifications qualify learners for roles in service or help desk, support, cloud services, IT admin, and more. Generally, learners interested in pursuing the MCSA Windows 10 certification should have six months to two years of professional experience, including direct experience with Windows desktop administration, maintenance, and troubleshooting; basic experience with and understanding of Windows networking technologies; and basic knowledge of Active Directory and Microsoft Intune. Microsoft considers the MCSA certification an entry-level certification, however, learners should note that CBT Nuggets lists the relevant coursework as intermediate due to the complexity of the content. Like all Microsoft certifications, MCSA certifications do not expire, and therefore, don’t need to be renewed. MCSA certifications are valid for the lifetime of the Microsoft product. For instance, when you earn the MCSA Windows 10, then it will not expire when Microsoft releases the next version of Windows. However, the Windows 10 certification will not be valid for the next Windows version.ou’ll have to earn a certification for the new product to remain current. Despite the fact that MCSA certifications are valid for life, they only validate knowledge for one technology. They aren’t widely applicable to the entire suite of Microsoft products. Learn more about the new Microsoft certification structure. CBT Nuggets offers study plans that map to Anthony Sequeira‘s Microsoft Windows 10 70-697: Configuring Windows Devices and Microsoft Windows 10 70-698: Installing and Configuring Windows 10 70-698 courses. These downloadable Microsoft MCSA: Windows 10 study plans break down the courses and supplemental learning resources to equip learners with a strategic and manageable approach to conquer training goals. Download the Microsoft MCSA: Windows 10 70-697 and 70-698 study plans. Learners can take the certification exams for the MCSA Windows 10 in any order, but most choose to take the exams out of sequential order, starting with the 70-698 and moving on to the 70-697. In addition, learners who earned an MCSA: Windows 8 certification between February 15, 2015 and May 31, 2015 can take the 70-697 exam for free. Learn more about the opportunity to take the 70-697 for free from Microsoft. *Because the number of questions varies, it is not necessarily true that learners must earn 70 percent to pass the exam. Exam day logistics: On testing day, you’re required to bring two forms of original, valid IDs — one must be government-issued with name, photo, and signature, and one a secondary ID (with only name required). You will be provided with an erasable note board and marker that can be used during your exam. Most personal items, including cell phones, watches, and food and beverage, are not permitted in the testing center. Skills Measured: Each exam registration page on the Microsoft website provides a list of Skills Measured (free resources) to guide your study and preparation. Microsoft exams have a reputation for being challenging. Many learners find they have to take an exam more than once to achieve a successful outcome. Fortunately, Microsoft is aware of the level of challenge associated with their exams, and often provides an Exam Replay, allowing learners to retake exams at no cost. Please note that the Exam Replay may not always be available. As of this post’s publication date, both the 70-698 and 70-697 exams include an Exam Replay, but that may change. Learners should research Exam Replay availability to avoid missing out on the opportunity. 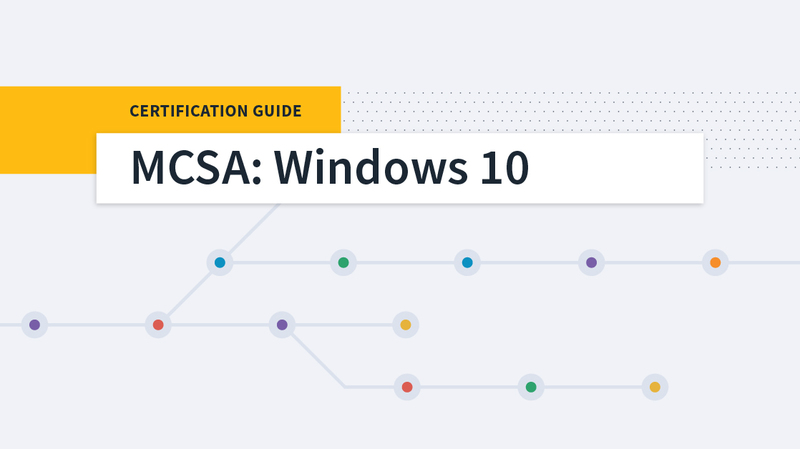 Most learners who successfully earn the MCSA: Windows 10 certification will continue on the same track, advancing their certification to the expert level with the MCSE. Under Microsoft’s new certification structure, earning the MCSE: Mobility certification requires that learners pass just one additional exam from a pool of three exam options: 70-695: Deploying Windows Desktops and Enterprise Applications; 70-696: Administering System Center Configuration Manager and Intune; and 70-398: Planning for and Managing Devices in the Enterprise. Payscale.com and SimplyHired.com are excellent resources for helping learners determine average pay scales for job opportunities associated with roles in IT. The MCSA Windows 10 certification is typically held by system administrators. SimplyHired.com reports an average salary for those administering Windows 10 as $58,311. Payscale.com reports a broader range of salaries, dependent on professional experience, as $41,635 to $134,882. Common roles or titles for those who hold a Windows 10 certification include network administrator, systems administrator, IT manager, and senior systems administrator. This is a great time to pursue a Windows 10 certification. The product is on track to overtake Windows 7 (if it hasn’t already), meaning IT pros need to be prepared to effectively and efficiently support and administer Windows 10. Earning the MCSA Windows 10 certification equips you with the skills and knowledge you need to meaningfully support your organization while also advancing your career. Watch. Learn. Conquer Microsoft Windows 10! This is an almost must have certification now for many IT departments. If your company is based on Windows 10 then go ahead and pursue this cert. MSCE is the recommended end goal but the Windows10 MCSA is a great quick alternative while you are on your path to an MSCE.